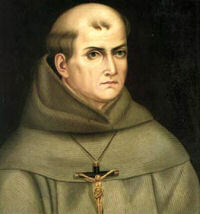 O God, who by your ineffable mercy have been pleased through the labors of your priest Saint Junipero Serra to count many American peoples within your Church, grant by his intercession that we may so join our hearts to you in love, as to carry always and everywhere before all people the image of your Only Begotten Son. Who lives and reigns with you in the unity of the Holy Spirit, one God, for ever and ever. Oranges in Honey and Olive Oil "Núñez de Prado"
Miguel Jose Serra was born on the island of Mallorca, Spain. He took the name Junipero when he entered the Franciscan Order in 1730. Ordained in 1737, he taught philosophy and theology at the University of Padua for twelve years. At age 37, he went to Mexico City where he spent the rest of his life working for the conversion of the peoples of the New World. Largely responsible for the spread of the Church on the West Coast of the United States, Junipero founded 21 missions and converted thousands of Native Americans. Pope Francis canonized Junipero Serra during his visit to the United States on September 23, 2015. The celebration for the first Hispanic saint of the U.S. was held on the lawn in front of the National Shrine in Washington, D.C.
St. Oliver Plunkett, Archbishop of Armagh and the last Catholic martyr of England was born in Loughcrew, County Meath, Ireland. He want to Rome where he entered the Irish Collage and received ordination in 1654. Before the reform of the General Roman Calendar today was the feast of the Most Precious Blood of Our Lord Jesus Christ. Precious Blood of our Savior, the life giving spring made ever open by the redeeming Cross! You wash away the stains of the whole world and in the Church, Paradise regained, you bring forth flowers of sanctity. In 1776, when the American revolution was beginning in the east, another part of the future United States was being born in California. That year a gray-robed Franciscan founded Mission San Juan Capistrano, now famous for its annually returning swallows. San Juan was the seventh of nine missions established under the direction of this indomitable Spaniard. Born on Spain's island of Mallorca, Serra entered the Franciscan Order, taking the name of Saint Francis' childlike companion, Brother Juniper. Until he was thirty-five, he spent most of his time in the classroom-first as a student of theology and then as a professor. He also became famous for his preaching. Suddenly he gave it all up and followed the yearning that had begun years before when he heard about the missionary work of Saint Francis Solanus in South America. Junipero's desire was to convert native peoples in the New World. Arriving by ship at Vera Cruz, Mexico, he and a companion walked the 250 miles to Mexico City. On the way Junipero's left leg became infected by an insect bite and would remain a cross, often life-threatening, the rest of his life. For eighteen years he worked in central Mexico and in the Baja Peninsula. He became president of the missions there. Enter politics: the threat of a Russian invasion south from Alaska. Charles III of Spain ordered an expedition to beat Russia to the territory. So the last two conquistadores-one military, one spiritual-began their quest. Jose de Galvez persuaded Junipero to set out with him for present-day Monterey, California. The first mission founded after the nine-hundred-mile journey north was San Diego (1769). That year a shortage of food almost canceled the expedition. Vowing to stay with the local people, Junipero and another friar began a novena in preparation for Saint Joseph's day, March 19, the scheduled day of departure. On that day, the relief ship arrived. Other missions followed: Monterey/Carmel (1770); San Antonio and San Gabriel (1771); San Luis Obispo (1772); San Francisco and San Juan Capistrano (1776); Santa Clara (1777); San Buenaventura (1782). Twelve more were founded after Serra's death. Junipero made the long trip to Mexico City to settle great differences with the military commander. He arrived at the point of death. The outcome was substantially what Junipero sought: the famous "Regulation" protecting the Indians and the missions. It was the basis for the first significant legislation in California, a "Bill of Rights" for Native Americans. Because the Native Americans were living a nonhuman life from the Spanish point of view, the friars were made their legal guardians. The Native Americans were kept at the mission after Baptism lest they be corrupted in their former haunts — a move that has brought cries of "injustice" from some moderns. Junipero's missionary life was a long battle with cold and hunger, with unsympathetic military commanders and even with danger of death from non-Christian native peoples. Through it all his unquenchable zeal was fed by prayer each night, often from midnight until dawn. He baptized over six thousand people and confirmed five thousand. His travels would have circled the globe. He brought the Native Americans not only the gift of faith but also a decent standard of living. He won their love, as witnessed especially by their grief at his death. He is buried at Mission San Carlo Borromeo, Carmel, and was beatified in 1988. Excerpted from Saint of the Day, Leonard Foley, O.F.M. Read about St. Junipero Serra and the California Missions here and here. Read this excellent article at Catholicism.org. Send someone an e-card for St. Junipero's feast. Purchase a copy of The Man Who Founded California: The Life of Blessed Junipero Serra from Amazon.com. Oliver Plunket was born on 1 November 1625 into an influential Anglo-Norman family at Loughcrew, near Oldcastle, Co Meath. In 1647, he went to the Irish College in Rome to study for the priesthood and was ordained a priest in 1654. The arrival of Cromwell in Ireland in 1649 initiated the massacre and persecution of Catholics. Cromwell left in 1650 but his legacy was enacted in anti-Catholic legislation. During the 1650s, Catholics were expelled from Dublin and landowners were dispossessed. Catholic priests were outlawed and those who continued to administer the sacraments were hanged or transported to the West Indies. To avoid persecution, Plunket petitioned to remain in Rome, and in 1657 became a professor of theology. In 1670, he summoned an episcopal conference in Dublin, and later held numerous synods in his own arch diocese. However, he had a long standing difference with the archbishop of Dublin, Peter Talbot, over their rival claims to be primate of Ireland. He also antagonized the Franciscans, particularly when he favored the Dominicans in a property dispute. With the onset of new persecution in 1673, Plunket went into hiding, refusing a government edict to register at a seaport and await passage into exile. In 1678, the so-called Popish Plot concocted in England by Titus Oates led to further anti-Catholicism. Archbishop Talbot was arrested, and Plunket again went into hiding. The privy council in London was told he had plotted a French invasion. In December 1679, Plunket was imprisoned in Dublin Castle, where he gave absolution to the dying Talbot. Taken to London, he was found guilty in June 1681 of high treason on perjured evidence from two disaffected Franciscans. On 1 July 1681, Plunket became the last Catholic martyr in England when he was hanged, drawn and quartered at Tyburn. He was beatified in 1920 and canonized in 1975, the first new Irish saint for almost seven hundred years. Dr. Oliver Plunket was. arraigned at the King's Bench, May 3, 1681, for "high treason, in endeavoring and compassing the king's" death, and to levy war in Ireland, and to alter the true religion there, and to introduce a foreign 'power.' The particulars of his trial, as well as his speech at the place of execution, may be found in the third volume of the State Trials, p. 294, Margrave's edit. Dr. Burnet gives us no very favorable idea of the equity of the proceedings against him. ' Some lewd Irish priests (says he) and others of that nation, ' hearing that England was at that time disposed to hearken to good swearers, thought themselves well qualified for the employment; so they came over to swear, that there was a great plot in Ireland, to bring over a French army, and to massacre all the English. The witnesses were brutal and profligate men, yet the earl of Shaftsbury cherished them much: they were examined by the parliament at Westminster and what they said was believed. Upon that encouragement it was reckoned, that we should have witnesses come over in whole companies. Lord Essex told me, that this Plunket was a wise and sober man, who was always in a different interest from the two Talbots; the one of these being the titular primate of Dublin, and the other came to be raised afterwards to be Duke of Tirconnell. These were meddling and factious men, whereas Plunket was for their living quietly, and in due submission to the government, without engaging into intrigues of state. Some of these priests had been censured by him for their lewdness: and they drew others to swear as they directed them. They had appeared the winter before, upon a bill offered to the grand jury: but as the foreman of the jury, who was a zealous Protestant, told me, they contradicted one another so evidently, that they would not find the bill. But now they laid their story better together and swore against Plunket, that he had got a great bank of money to be prepared, and that he had an army listed, and was in a correspondence with Franco, to bring over a fleet from thence. He had nothing to say in his own defense, but to deny all: so he was condemned; and suffered very decently, expressing himself in many particulars as became a bishop. He died denying every thing that had been sworn against him. The following account of the manner of his execution is given in a little work, entitled, Ireland's Case: briefly stated; or a summary Account of the most remarkable Transactions in that Kingdom, since the Reformation. 1675. His speech ended, and his cap drawn over his eyes, he again recommended his happy soul with raptures of devotion into the hands of Jesus, his Savior, for whose sake he died, till the cart was drawn from under him. Thus then he hung betwixt heaven and earth, an open sacrifice to God for innocence and religion. As soon.as he expired, the executioner ripped up his belly and breast, and pulling out his heart and bowels, threw them into the fire, ready kindled near the gallows for that purpose: the rest of his body, having been begged of the king, was carried by his friends to a house near St. Giles's church; the trunk, whereof was placed in a coffin, his head and arms to the elbow, being reserved out of the coffin, and disposed of elsewhere; then the body was interred in the church.yard, and a copper plate placed on his breast, whereon was engraven these following words, set here down for the satisfaction of the curious: "In this tomb resteth the body of the right reverend Oliver Plunket, archbishop of Armagh, and primate of Ireland, who in hatred of religion was accused of false witnesses, and for the same condemned, and executed at Tyburn; his heart and bowels being taken out and cast into the fire: he suffered martyrdom with constancy, the 1st of July, 1681, in the reign of king, Charles II." Patron: Archdiocese of Armagh, Ireland. 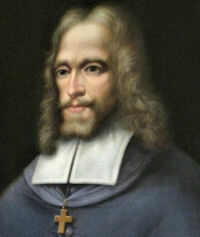 Read St. Oliver Plunket's moving speech at his execution. Read this Life of St. Oliver Plunket. Visit the Shrine of St. Oliver Plunket and also Tyburn Convent. July is traditionally associated with the Precious Blood of Our Lord. It may be customary to celebrate the votive Mass of the Precious Blood today. The extraordinary importance of the saving Blood of Christ has ensured a central place for its memorial in the celebration of this cultic mystery: at the centre of the Eucharistic assembly, in which the Church raises up to God in thanksgiving "the cup of blessing" (1 Cor 10, 16; cf Ps 115-116, 13) and offers it to the faithful as a "real communion with the Blood of Christ" (1 Cor 10, 16); and throughout the Liturgical Year. The Church celebrates the saving Blood of Christ not only on the Solemnity of the Body and Blood of Christ, but also on many other occasions, such that the cultic remembrance of the Blood of our redemption (cf 1 Pt 1, 18) pervades the entire Liturgical Year. Hence, at Vespers during Christmastide, the Church, addressing Christ, sings: "Nos quoque, qui sancto tuo redempti sumus sanguine, ob diem natalis tui hymnum novum concinimus." In the Paschal Triduum, the redemptive significance and efficacy of the Blood of Christ is continuously recalled in adoration. During the adoration of the Cross on Good Friday the Church sings the hymn: "Mite corpus perforatur, sanguis unde profluit; terra, pontus, astra, mundus quo lavanturflumine", and again on Easter Sunday, "Cuius corpus sanctissimum in ara crucis torridum, sed et cruorem roesum gustando, Deo vivimus" (194). In Some places and in certain particular calendars, the feast of the Most Precious Blood of Christ is still observed on 1 July. This feast recalls the various titles of the Redeemer. Antonio Rosmini was born on 24 March 1797 to Pier Modesto and Giovanna dei Conti Formenti di Riva at Rovereto, a very "Italian" town although part of the Austrian Empire since 1509. He was baptized the following day and received his early education locally. In 1816 he enrolled at the University of Padua, Italy, where he received doctorates in theology and canon law. After his studies he returned to Rovereto to prepare for Holy Orders. In February 1820 he accompanied his sister, Margherita, to Verona where the Marquess Maddalena of Canossa (now Blessed) had founded a religious institute. During the visit Maddalena invited him to found a male religious institute as a twin to her own institute. While the young man politely declined, her invitation in time proved prophetic. Antonio was ordained a priest on 21 April 1821 at Chioggia, Italy. In 1823 he travelled to Rome with the Patriarch of Venice, who arranged an audience for him with Pope Pius VII. In that audience the Pontiff encouraged him to undertake the reform of philosophy. In 1826 he went to Milan to continue his research and publish the results of his philosophical studies. He wrote on many subjects, including the origin of ideas and certitude, the nature of the human soul, ethics, the relationship between Church and State, the philosophy of law, metaphysics, grace, original sin, the sacraments and education. On Ash Wednesday, 20 February 1828, Fr Rosmini withdrew to write the Constitutions of the budding Institute of Charity, in which he incorporated the principle of passivity (to be concerned with one's personal sanctification until God's will manifests itself to undertake some external work of charity) and the principle of impartiality (to free one of any personal preference in assuming a work of charity). To assure himself of God's will in his philosophical and foundational work, Rosmini went to Rome a second time, in November 1828, and there received Pope Leo XII's support. On 15 May 1829 he met with the new Pope, Pius VIII, who confirmed his double mission as philosopher and founder. 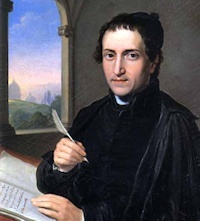 During this visit to Rome, Fr Rosmini published "Maxims of Christian Perfection" and "Origin of Ideas", winning the admiration of many scholars. By 1832 the Institute of Charity had spread to Northern Italy and by 1835 it reached England, where the community enjoyed substantial growth. In England the Rosminians are credited with introducing the use of the Roman collar and cassock and the practice of wearing the religious habit in public. They were known for preaching missions, the practice of the Forty Hours, May devotions, the use of the scapular, novena celebrations, public processions and the blessing of throats on the feast of St Blaise. Pope Gregory XVI approved the Constitutions of the Institute of Charity on 20 December 1838. On 25 March 1839 vows were taken by 20 Italian and 6 British priests. On 20 September 1839 Fr Rosmini was appointed provost general for life. This happy period of growth and apostolic success, however, was tempered by opposition to his intellectual and philosophical writings from 1826 until his death. Primarily his "Treatise on Moral Conscience" (1839) led to a sharp, 15-year controversy which required more than one Papal injunction to silence the "Rosminian Question". Another important, controversial work was "The Five Wounds of the Church" (1832). Fr Rosmini found himself wedged between the obligation to renew Catholic philosophy and finding his works on the Index. But his obedience to the Church was admirable: "In everything, I want to base myself on the authority of the Church, and I want the whole world to know that I adhere to this authority alone" (Congregation for the Doctrine of the Faith, "Note on the Force of the Doctrinal Decrees", L'Osservatore Romano English edition [ORE], 25 July 2001, p. 9). To close the issue definitively, the Pontiff submitted all Rosmini's works to examination by the Congregation of the Index. On 3 July 1854, it was decreed: "All the works of Antonio Rosmini-Serbati that have recently been examined are to be dismissed, and this examination in no way detracts from the good name of the author, nor of the religious Society founded by him, nor from his life and singular merits towards the Church" (R. Malone, "Historical Overview of the Rosmini Case", ORE, 25 July 2001, p. 10). Less than a year after this Decree Fr Antonio Rosmini died on 1 July 1855 at Stresa, Italy, at age 58.